Songbook for the CrusaderBeach album ‘Piano Songs Volume 2’. This 44-page e-Book features another collection of simple yet beautiful solo piano instrumentals by CrusaderBeach. 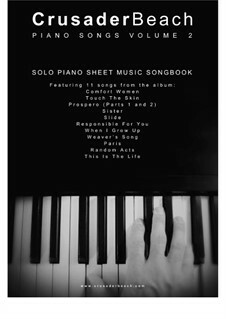 Comprising sheet music for eleven songs from the album: ‘Comfort Women’, ‘Touch The Skin’, ‘Prospero (Parts 1 and 2)’, ‘Sister’, ’Slide’, ‘Responsible For You’, ‘When I Grow Up’, ‘Weaver’s Song’, ‘Paris’, ‘Random Acts’ and ‘This Is The Life’. 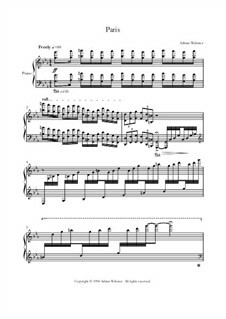 All CrusaderBeach solo piano music has been composed by Adrian Webster (PRS CAE/IPI: 702739746). If you like the contemporary instrumental, new age music of Ludovico Einaudi, Yiruma, Yann Tiersen, Michele McLaughlin, Jon Schmidt of the Piano Guys, George Winston or David Lanz, you'll enjoy playing the beautiful, original piano music of CrusaderBeach. The song sheets are a popular choice with piano players, music teachers, students and wedding pianists. CrusaderBeach songs are available to download and stream from all major outlets (iTunes, Amazon, Spotify etc.) and are regularly used as background music for short films and wedding ceremonies. 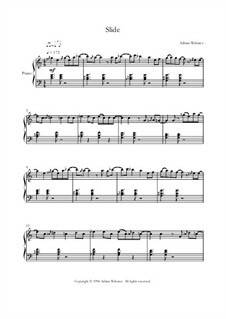 This is the sheet music for the CrusaderBeach song ‘Comfort Women’ from the album ‘Piano Songs Volume 2’ - a mid-tempo, reflective solo piano piece with a repetitive theme running throughout. 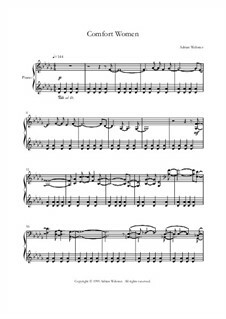 This is the sheet music for the CrusaderBeach piano song 'Touch The Skin' from the album 'Piano Songs Volume 2' - a simple, beautiful solo piano piece featuring a heart-warming, romantic melody. This is the sheet music for the CrusaderBeach song ‘Prospero (Parts 1 and 2)’ from the album ‘Piano Songs Volume 2’ - a solo piano piece split into two playing moods with the first half in a gentle, flowing mid-tempo pace and the second half in a faster, dramatic style. 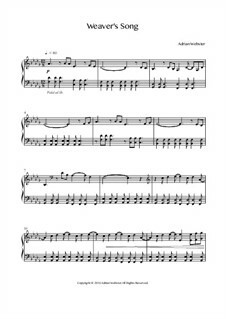 This is the sheet music for the CrusaderBeach song ‘Sister’ from the album ‘Piano Songs Volume 2’ - a lively, happy solo piano piece with a catchy melody. 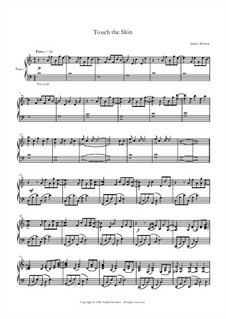 This is the sheet music for the CrusaderBeach song ‘Slide’ from the album ‘Piano Songs Volume 2’ - an up-tempo, bright and lively solo piano piece with a jazzy feel. 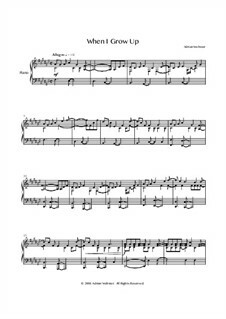 This is the sheet music for the CrusaderBeach piano song 'Responsible For You' from the album 'Piano Songs Volume 2' - a simple, beautiful solo piano piece with a gentle melody. 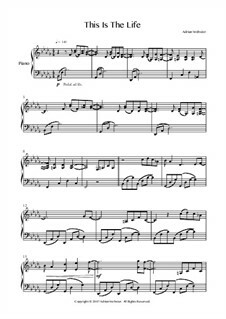 This is the sheet music for the CrusaderBeach piano song 'When I Grow Up' from the album 'Piano Songs Volume 2' - a lively, upbeat solo piano piece with a joyful melody. 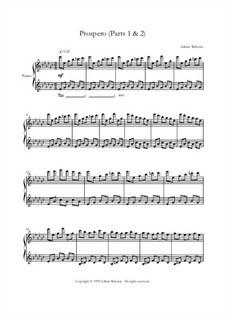 This is the sheet music for the CrusaderBeach piano song 'Weaver's Song' from the album 'Piano Songs Volume 2' - a simple, beautiful solo piano piece with a gentle, reflective mood. 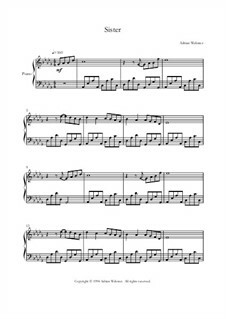 This is the sheet music for the CrusaderBeach song ‘Paris’ from the album ‘Piano Songs Volume 2’ - a grand and epic-sounding solo piano piece with a classical feel to it. 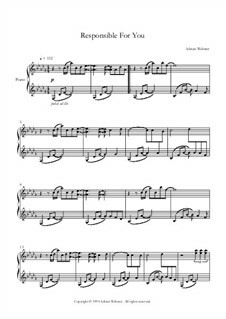 This is the sheet music for the CrusaderBeach piano song 'Random Acts' from the album 'Piano Songs Volume 2' - a gentle, atmospheric solo piano piece with a melancholy feel and an air of mystery. 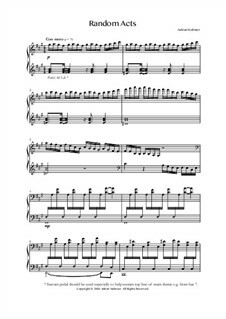 This is the sheet music for the CrusaderBeach piano song 'This Is The Life' from the album 'Piano Songs Volume 2' - an uplifting, inspirational solo piano piece with a beautiful melody. Ideal for celebratory occasions such as weddings / birthdays or Christmas / New Year holiday. классный сборник, но понравились не все композиции. Всё равно огромное спасибо, за классную музыку.